A traditional French dish with a twist. 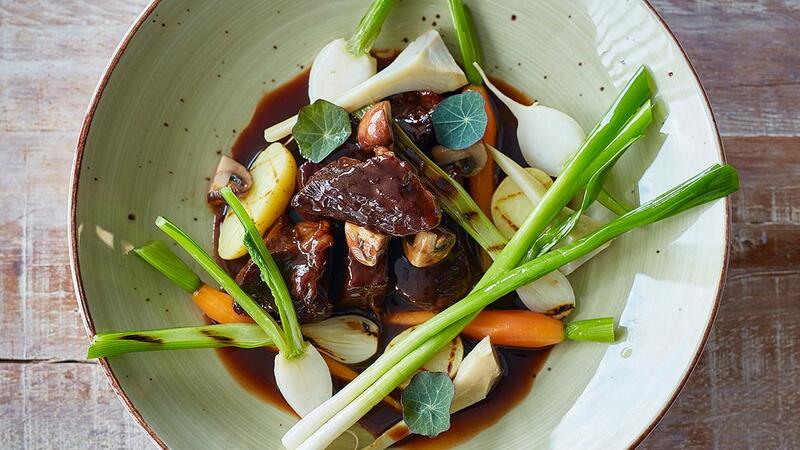 Red wine, onions and chocolate all make an appearance in this classic Boeuf Bourguignon. Cut the beef in equal parts 2 X 2 cm and season with pepper and salt. Clean and cut the carrot, onion and garlic. Cut the bacon in small stripes. Fry the beef in vegetable oil. Add the bacon together with the carrot, onion and garlic. Add the prepared Knorr Demi Glaze. Simmer for about 3 hours until the meat is tender. Finish the sauce with grated dark chocolate to your own taste.Bring the meat back in the sauce. Clean and boil the potatoes and grill them. Boil the cleaned artichokes together with splash of lemon juice. Clean the carrots and turnips, boil them and stew later in butter. Cut the mushrooms in quarters and fry them until golden. Clean the spring onions, grill or stew. Serve the stewed meat in deep plate. Finish and divide the vegetables.